Flavia Licciardello studied classical philology at the University of Bologna. 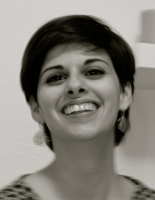 She is a doctoral fellow at the Excellence Cluster Topoi in the research group (C-1) Deixis and Frames of Reference with a project on “Communicative strategies in new context: from verse inscriptions to literary epigrams”. She also participates in the doctoral program”Ancient Languages and Texts” (ALT) of the Berlin Graduate School of Ancient Studies (BerGSAS). Her project focuses on dedicatory epigrams from the Hellenistic era. Her aim is to analyse the use of deixis and frames of reference both in actual verse inscriptions and in Hellenistic literary epigrams of an inscriptional type.